From the breathtaking fells, to the shimmering lakes, Lakeland Walks & Talks will offer you an introduction to the Lake District. At Lakeland Walks & Talks we have chosen routes to cater for those venturing onto the Fells for the first time, or friends who wish to learn and discover more. As the Lakes wouldn’t be the Lakes without the rain! Unsure of the routes... Need some inspiration... Let me show you! Thanks for a great day out! It was really fantastic and felt like such an achievement! I really will take all your tips on board and hopefully will do more training in August with you! 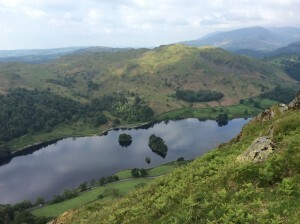 Really enjoyed our walk up to Loughrigg today. Shame it was raining but that didn’t spoil the amazing views at the top. Still worth it. Thanks Steve!! What a fantastic day walking to Easedale Tarn! Beautiful scenery and stunning views. The route was easy going so just perfect for me. Steve’s stories were very good and amusing! Great company, would definitely go again.